Kindle Apps, Seriously? 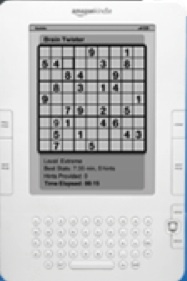 Is Apple Supposed To Be Scared of E-Ink Sudoku? If you are going to try to steal Apple’s thunder just before its big Tablet announcement, you are going to have to do a little bit better than E-Ink Sudoku. Amazon is obviously concerned that the upcoming Apple Tablet, which will be able to function as a lush, full-color electronic reader for newspapers, books, and magazines might overshadow the black-and-white Kindle with its dot-matrix feel. So what does it do? It matches Apple’s rev-share with app developers by raising the royalty it gives publishers to 70 percent, starts to practically give away Kindles, and opens up the Kindle to developers. That’s right, there is now a Kindle Development Kit and there will soon be Kindle Apps. So instead of just books, you will be able to play Sudoku and scroll through interactive Zagat guides. Maybe you’ll be able to play Space Invaders or Pong, if the E-Ink technology the screen is based on can ever refresh fast enough for you to shoot the aliens. The Kindle will support free apps, one-time purchases, and subscriptions. Kidding aside, I can see some useful, text-based apps that could use some interactivity, but what you’d end up with is a Kindle version of a Website. (The Kindle already does come with a primitive browser which could be improved upon). At least the keyboard might now actually serve a purpose. But if Amazon really wants to open up the Kindle, what it should do is allow other hardware and software developers to create their own electronic readers that work with the Kindle store. Presumably the existing Kindle for the IPhone app will work on the Tablet as well. Given the choice between developing beautiful, touchscreen, GPS-enabled, gyroscopic apps for an Apple Tablet and dorky E-Ink apps for the Kindle, developers are going to go with the Tablet first, is my bet. But maybe I’m wrong. What Kindle apps are you dying for?